Cooking a whole chicken in your electric pressure cooker is almost as easy as buying a precooked rotisserie chicken! In a small bowl, combine the olive oil, salt, paprika, pepper, herbes de Provence, and cayenne. Place the chicken on a cutting board and rub the olive oil mixture under the skin and all over the outside. Stuff the cavity with the lemon halves, garlic cloves, and 3 to 4 wedges of onion. Pour the broth into the electric pressure cooker. Add the remaining onion wedges, carrots, and celery. Insert a wire rack or trivet on top of the vegetables. Place the chicken, breast-side-up, on the rack. Cook on high pressure for 21 minutes. When the cooking is complete, hit Cancel and allow the pressure to release naturally for 15 minutes, then quick release any remaining pressure. Carefully remove the chicken to a clean cutting board. Remove the skin and cut the chicken into pieces or shred/chop the meat, and serve. 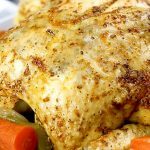 The rule of thumb for cooking whole chickens is 6 minutes per pound: a 3-pound chicken will take 18 minutes and a 4-pound chicken will take 24 minutes. Repurpose tip: Save the bones to make Chicken Bone Broth and strain the liquid remaining in the pot to replace some of the water in the bone broth recipe for even more flavor.